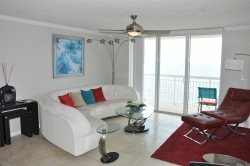 Ocean Bay Club 210 comes wonderfully furnished and will be a delight for your family and friends as they enjoy a fun, relaxing vacation. Enjoy the Ocean Drive Difference by starting your vacation immediately upon arrival, as this property comes with fresh bed linens/bath towels, the beds are already made up for you, and the departure maid service are all included in your price. This 4 bedroom corner unit sleeps 9 and features a fully equipped kitchen with Keurig, dining area for 8, an oceanfront balcony, and fun amenities for you to use throughout your stay. The living room will make you feel right at home with comfortable furniture, a 65" TV, and incredible ocean view. The master bedroom features an ocean view, private bath, and a 50" TV. Three guest rooms perfectly accommodate your group, and a second balcony gives a bonus vantage point for beautiful beach views. You can also see the ocean from all the bedrooms, a rare treat for North Myrtle Beach vacationers. This unit also comes with its own Netflix account for added entertainment and free WiFi to stay connected. Lucky guests who stay in this unit- Memorial Day through Labor Day - will also have access to a beach umbrella & 2 chairs delivered to the beach daily for your stay! Guests of Ocean Bay Club will enjoy the pool deck complete with large pool, lazy river, hot tub and kiddie pool. There's also an indoor pool for rainy days. Easily park your car on the 2nd level and get instant access to the condo without setting foot in an elevator! You'll also be within walking distance to shops, restaurants, live music, and other activities. Call now or book online and be one of the lucky ones to call themselves guests of Ocean Bay Club 210!